Fyodor Mikhaylovich Dostoyevsky is without doubt the most well-known of all famous people who had epilepsy. Dostoyevsky's illness is a known fact to many people who otherwise have no knowledge of epilepsy, and indeed, for many people, reading Dostoyevsky's works is the first intensive contact that they have with a person with epilepsy. More than anyone else, Dostoyevsky used his own illness and the suffering that went with it as a theme in his writing. The writer made many people in his stories and novels have epilepsy. The most well-known figure is Prince Myshkin in the novel 'The Idiot'. This character also reveals most about Dostoyevsky's own illness. We can take it as read that the many accounts of epileptic seizures which Dostoyevsky gives in his works - the crescendo-like onset of the seizures, their overwhelming symptoms, the dramatic effects which the seizures have on the people around the person with epilepsy - are based on the writer's own experience. 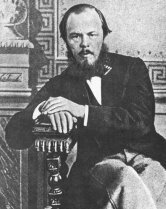 Dostoyevsky himself states that he had his first seizure one Easter night during the period of his banishment (on account of his contacts with revolutionary circles, the writer was sentenced to death in 1850, but was reprieved just before the sentence was carried out and banished to Siberia for four years). He was then aged about 30. These types of seizures were probably secondary generalised grand-mal seizures triggered by focal activity as Dostoyevsky's seizures were generally preceded by an aura which was apparently accompanied by a feeling of happiness. It is this euphoric feeling, this 'terrible gift of mercy from his epilepsy' which Dostoyevsky describes in detail in Prince Myshkin, who is clearly an autobiographical figure. There is no doubt that Dostoyevski's own perception of his epilepsy left a deep impression on his life. It had a great influence on many aspects of his work and enabled him to understand and feel things in such depths which would not have been possible had he not suffered from the disease. We are justified, therefore, in stating that without Dostoyevsky's epilepsy, 19th century literature would not have been so rich.